After hearing raves about this new, small storefront from several people in the neighborhood, I decided to check it out. My order of 12 lollipopped wings, piping hot right out of the fryer and spiced to a level 3 of 4, were excellent. They were a bit sweet, nicely spiced and a wee bit funky, too. They were light and crispy on the outside and very juicy inside. Really nice stuff. I met the owner, Eddie, who told me that they've been open since just before Thanksgiving. He also mentioned that their wings are never frozen. Right now the signage is not great but that should change soon. And for now, it's byo, as well. I went for a second time today and I'd say they've gotten even better - particularly with regard to the highest heat level. Well-fried and juicy both times. This place is dangerous to have nearby. As a long time Great Seas Chinese fan I'm jumping on the Landbirds bandwagon! Heat level #4 just right, crisp, juicy, delicious frenched drumettes. Landbirds, Count me a Fan! On Saturday for my boyfriend's birthday we did a "wing crawl" through the area. First stop was D-Men, then on to Son of a Butcher and then Landbirds was the last stop. My favorite of the night was Landbirds. What's not to love? Spicy, Cruchy, Salty, Sweet! Don't get me wrong, the other 2 places also have great wings. Landbirds lolli-pop style put them over the edge. I can't wait to go back. 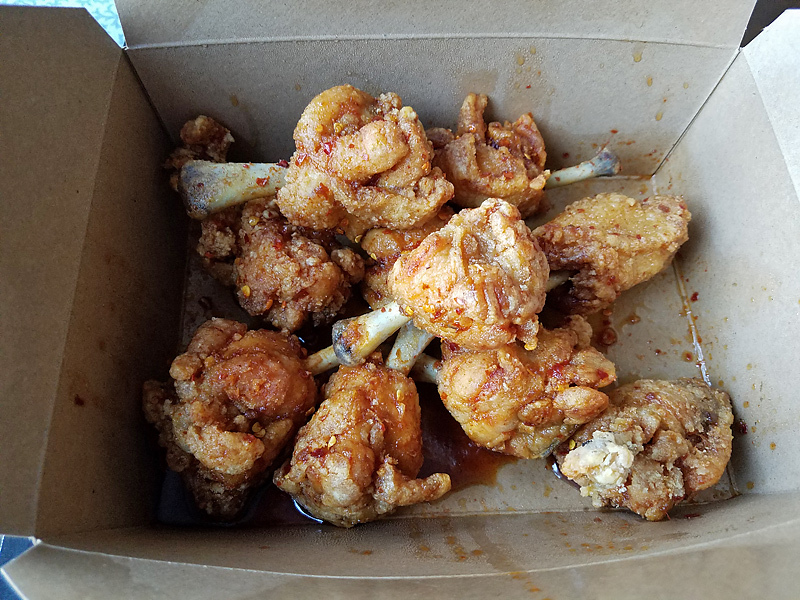 I'm continuing to love Landbirds' wings (spicy tiger, 4/4 on the heat level, are outstanding) but at $20.99/dozen, they seem a bit pricey. Am I off-base on this? I don't do a lot of winging, so I don't really know. But nearly $2 a wing does seem a bit expensive. ronnie_suburban wrote: I'm continuing to love Landbirds' wings (spicy tiger, 4/4 on the heat level, are outstanding) but at $20.99/dozen, they seem a bit pricey. Am I off-base on this? I don't do a lot of winging, so I don't really know. But nearly $2 a wing does seem a bit expensive. For reference, I looked up pricing at a couple other wing places. Great Sea charges $15.49 per 14-piece order and Bonchon charges $12.95 for an order of 10. So, on a per-piece basis, pricing is as follows . . .
Of course, this doesn't consider the quality or provenance of the ingredients but my initial impression that Landbirds' wings are relatively pricey was accurate. I don't get it. These are overpriced generic sweet Asian wings. Not even battered so it's barely crispy. botd wrote: I don't get it. These are overpriced generic sweet Asian wings. Not even battered so it's barely crispy. This is based on only 3 visits, so take it for what it's worth but I find them to be perfectly and pleasantly crispy on the outside -- and more importantly -- very juicy and tender inside. I don't know if it's a function of them never being frozen or some other method(s) used but the meat on these wings is a noticeable cut above just about everything else I've ever had in town. There's none of that fibrous, desiccated stuff that's pretty common with a lot of fried chicken. However, there's a premium to be paid for it here. Is there value? I guess that's for each of us to decide for ourselves. I'm really curious to hear how these compare to my gold standard Great Sea wings, which at the present time, I just can't get out of my head. ronnie_suburban wrote: I'm continuing to love Landbirds' wings (spicy tiger, 4/4 on the heat level, are outstanding) but at $20.99/dozen, they seem a bit pricey. The gold standard in overpriced wings, sweet Korean BBQ style specifically, is Dak on Granville. At $12.95 for 5 wings (2.59/per), Landbirds can carry on knowing they aren't the "worst". Another relevant comp is Crisp, at $9.95/5, $17.95/10 (1.99/1.79p). It should be noted that both of these are full wings, not French drumettes. I prefer full pieces to drumettes for the simple reason that w/ well-sauced wings - the more surface area and skin, the better. With a small space, it looks like Landbirds can live with some people passing based on lack of value and still do well in a 'premium' niche. The dak wings are humongous, as you note. I don't see how they're even in the same category. Longtime lurker, brother of DClose, lover of wings, and hopefully embedded this image right. Stopped by Landbird today and the wings were amazingly crisp and perfectly spicy. Contemplating a tray for Superbowl eatin'. The owner said they are going to be open Superbowl Sunday for tray order pick-up. I had a soft spot for previous tenant Anong as my walkable neighborhood Thai joint, but Landbird is softening the blow. The owner said they are going to be open Superbowl Sunday for tray order pick-up. I imagine that's going to be one helluva day over there! Landbirds for Saturday lunch was worth the wait after two failed attempts (they are closed Mondays, and needed to unexpectedly shut down this past Tuesday). On first bite, there was a juiciness to the chicken that made it clear they are using a better quality bird than most spots. I took some to go as a surprise for the friend who was with me on the previous visits (I couldn't tell her I was going yesterday out of fear of jinxing it), and she was also impressed by the texture and taste, even after some time. Probably because I have been eating so much Nashville hot chicken lately and didn't want to go straight to the "pain" level on the heat scale, I followed the suggestion (from the very engaging chef/owner Eddie Lee, manning the register) of ordering the second spiciest level and getting the hottest sauce on the side. Even the spiciest was well within my comfort zone, so I chose that for my friend. 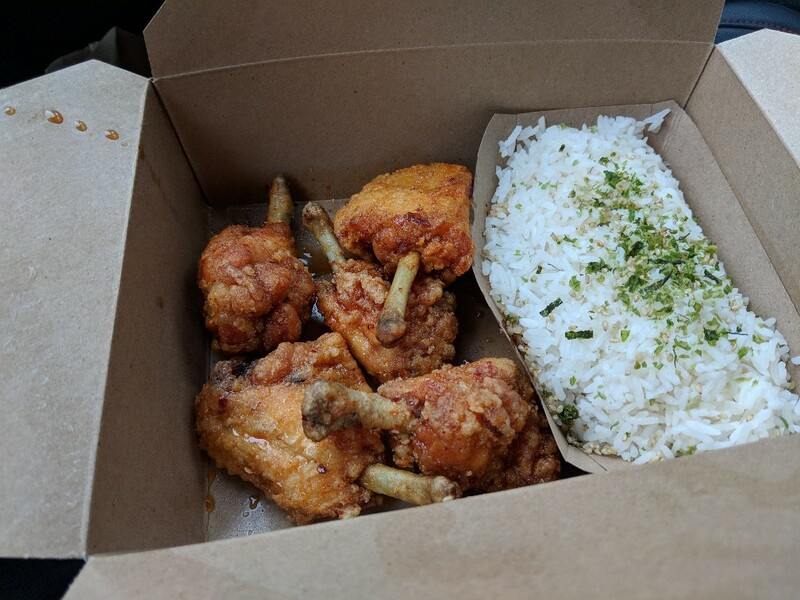 Also as a guide to first-timers, the six-piece and a few bites of the included rice (made even tastier with some of the side sauce) was plenty for lunch. I love places that focus on one item and try to perfect it, and Landbirds fits this mold. Second verse even tastier than the first. If I lived closer, or traffic wasn’t so bad, I’d be a Landbirds regular! I'm willing to pay extra for the labor required to french these wings, which makes for an all-around better eating experience. Finally made it to Landbirds yesterday night, and they are every bit as good as the hype suggests. I ordered mine at the second-highest spice level (I think) and I found them slightly and warmly spicy. [Disclaimer: I have a very high spice tolerance.] I'll order the spiciest kind next time, but I thoroughly enjoyed the sauce on these, and the rice soaked up the excess nicely at the end. The chicken itself was beautifully crisp on the outside, moist on the inside, perfect: candy in bird form. The space is somewhat bare-bones, but the people there were extremely friendly. I have no complaints and will certainly be back.